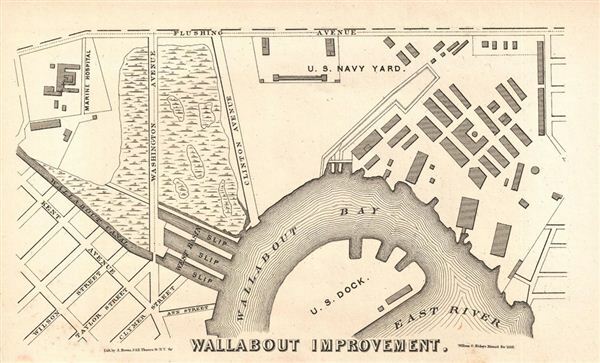 An uncommon 1868 map of the newly improved Wallabout Bay, home to the U.S. Navy Yard in Brooklyn, New York (also pictured, along with the Marine Hospital). Today the Brooklyn Navy Yard hosts an assortment of film studios and art spaces. This map was engraved by A. Brown to illustrate William G. Bishop's Brooklyn Manual of 1868. Bishop, William, Manual of the Common Council of the City of Brooklyn, 1868.